Ron here…in a contest based on a cocktail I made! I need some voters who are on Facebook also! Added: I have a Ginger Rogers post up at the Classic Movie Blog. Check it out here! A love letter to our Amba! From Weird Al Yankovic, no less! Think there will come a day when people will curse the name of Steve Jobs for what he has wrought? Hey say, Kats and Kittens! There is no particular reason for this post….I just feel the blog should not be left alone for so long! How is everyone doing? 1-10 scale, 10 being high, how’s your life overall at the moment? Is there something right now that makes you super happy? or sad? What’s the best meal you’ve had lately? Did you make it or did you go out? If you could meet any person from the Classical Age of Greece, who would it be? If you could meet anyone currently alive who would it be? The Official AmbienceMobile! 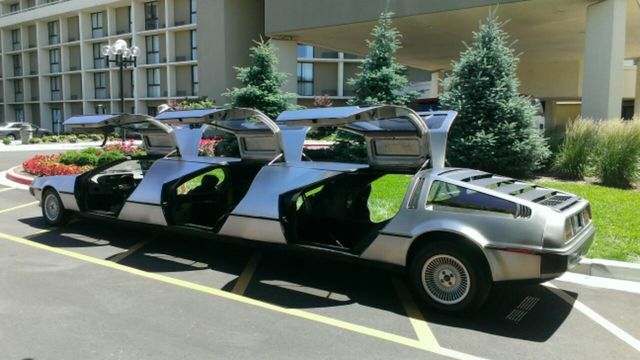 A stretch DeLorean. 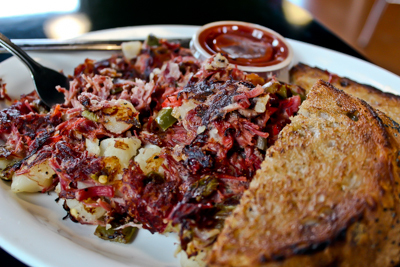 Zingerman’s corned beef hash…with toast! Pick a song…any song….make a point of singing that song out loud today! Just because! And NOT in the shower! Ron feels just doing so will make you feel better here in the Height of Summer.